The Way to Fairyland. Verses by E.E.B. 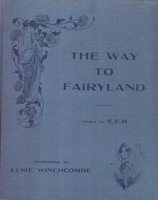 Illustrations by Elsie Winchcombe. See our delivery page for our delivery guidelines. This is a rare or used book from the Berkelouw Rare Books Department. N.P. n.d. (London: circa 1920). 4to. Orig. illust. cloth. With 8 full-page col. plates and num. text-illusts.